Today is Monday, November 7th. Oh where does time go? 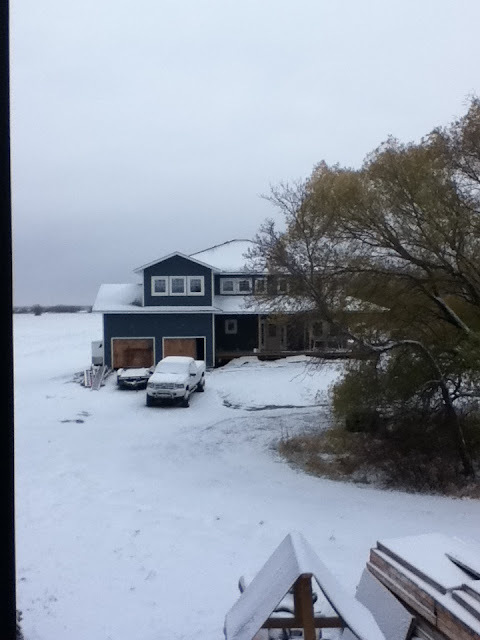 It snowed last night so this is the sight of the house from the barn. There is a thin covering of the white stuff over all. SNOW. How the seasons are transitioning before our eyes. Alvin is very glad that he got the siding down above the garage on Saturday afternoon. He and our friend Mike F came and gave him a hand, and when they were done, Alvin was breathing much easier. Now winter could come. I guess technically winter is not here officially until December, but somehow the snow just seems to BE winter to us! So the boys are at work inside the house. It is nice to be in there where it is warm and dry and with lights. We are very thankful for these things. It is a much different story than this time last year. Our boys worked through some very cold cold winter days! Where are things at? Well - the first and second floor are nicely painted! With color names such as HUMBLE, LATTE, ARCTIC WHITE, HYACINTHE, DEJA VU and SIZZLE ... you have to know that this house has taken on a new character of its own! You will be greeted with warm and inviting colors! We love the look so far! Alvin and I, and then Alvin and Willy, worked at assembling the cabinets for the kitchen. That will be the next big project - getting the kitchen ready! I can hardly wait. The pine for the flooring, was ordered and picked up last week! Another thing that will make the place warm and inviting! We are still needing work to be done in the lower level, which will house our private suite, but well - it will be done when it's done! I am not about to put any pressure on my sweet husband to do this ... he puts enough pressure on himself. God continues to bless the work of their hands, and I am so thankful that thus far, the build has been without incident or accident. Thank you Lord for your provision and protection thus far! There is still a lot to be done, but we are so thankful. The color I chose for the siding takes on a different hue depending on how sunny it is. It is a navy blue, but often looks more steel blue. I love it and we have had many compliments. It will eventually be complete with a nice star by the RED door. Right now we still have an old temporary door on. What else can I say? We are moving along. We are grateful. So, as the blanket of snow covers the ground, if you opened the door you would likely hear the music playing, and the sound of three men working! Day by day, one bit at a time. Thank you Lord!